The CID has been instructed by a high ranking official of the government, not to take into custody the elephant calves that are being kept illegally at the Colombo Gangaramaya Temple and the Kataragama Temple. Based on the information provided by the CID to court after investigations, the court had granted permission to the CID to take into custody the 15 illegally kept baby elephants. However, while 13 such illegally kept baby elephants have already been taken over by the CID, the remaining two elephants are kept at the above mentioned two temples. Meanwhile the powerful government official had instructed the Wildlife authority officers to look into the possibility of drafting legal papers for the two baby elephants kept at the two temples. When The Sunday Leader contacted the CID regarding the incident, a high ranking CID officer denied these charges and said that in certain instances, there were delays in confiscating these illegally kept baby elephants. The media had on many instances highlighted the fact that the two baby elephants being kept at the Colombo Gangaramaya Temple and the Kataragama Temple were being kept illegally without proper documentation. Again a good move by the government. What government has to do is to facilitate the temples to get legal documents for these jumbos, monitor whether these creatures are kept in acceptable conditions. Then, look into people getting elephants from their natural habitat illegally. Putting Buddhist monks behind bars will please some people but it is counter productive. Having said that government is deaf and dumb regarding encroaching crown land in places like Wilpattu (and harming hundreds of elephants and other wild life in danger). Government authorities have to manage macro level rather than micro level! 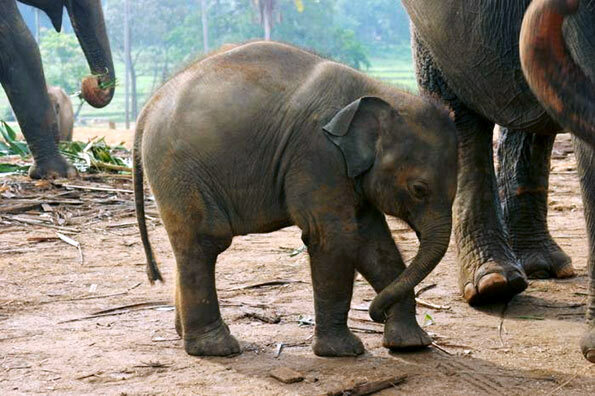 It is a shame to take these elephant calves away from there mothers. Animals have a feeling too. They need the rich milk that mothers provide and that cannot be replaced by any other food supplement. I have seen baby elephants crying in captivity thinking about there’s mothers. The mothers also may be doing so, missing her dear baby. How do you like if your child is abducted like that? So please stop this inhuman activity. And remember this is a Buddhist country and we need to respect all living creatures.